Order Spraymalt Dark 500g from the Stirling Homebrew Shop UK. 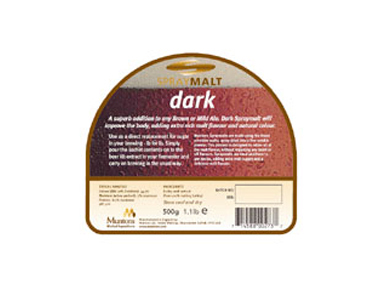 Buy Muntons Spray Malt - Dark 500g and other Sugar, Spraymalts, Hops safely online in the UK. You can use spray malt for making beer at home. Use it instead of sugar or as a combination. You can use spray malt for making beer at home. Use it instead of sugar or as a combination. We sell 4 different spraymalts: light, medium, dark and extra dark. Where to buy Spraymalt Dark 500g safely online? Shop at the Stirling Homebrew Shop if you are wondering where you can buy Muntons Spray Malt - Dark 500g safely online in the United Kingdom. Our Homebrew Shop is located in the UK and our independent store has been serving customers in England, Wales, Scotland and Northern-Ireland since 1976. You can buy our Sugar, Spraymalts, Hops online and we post out orders to any UK address. Spraymalt Dark 500g - Muntons Spray Malt - Dark 500g in Sugar, Spraymalts, Hops and Homebrew.